← Domínguez, Jorge I., Rafael Fernández de Castro, Contemporary U.S.-Latin American Relations: Cooperation or Conflict in the 21st Century? In Waves of Decolonization, David Luis-Brown reveals how between the 1880s and the 1930s, writer-activists in Cuba, Mexico, and the United States developed narratives and theories of decolonization, of full freedom and equality in the shadow of empire. They did so decades before the decolonization of Africa and Asia in the mid-twentieth century. Analyzing the work of nationalist leaders, novelists, and social scientists, including W. E. B. Du Bois, José Martí, Claude McKay, Luis-Brown brings together an array of thinkers who linked local struggles against racial oppression and imperialism to similar struggles in other nations. With discourses and practices of hemispheric citizenship, writers in the Americas broadened conventional conceptions of rights to redress their loss under the expanding United States empire. In focusing on the transnational production of the national in the wake of U.S. imperialism, Luis-Brown emphasizes the need for expanding the linguistic and national boundaries of U.S. American culture and history. 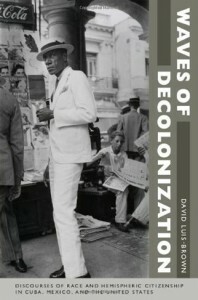 Luis-Brown traces unfolding narratives of decolonization across a broad range of texts. He explores how Martí and Du Bois, known as the founders of Cuban and black nationalisms, came to develop anticolonial discourses that cut across racial and national divides. He illuminates how cross-fertilizations among the Harlem Renaissance, Mexican indigenismo, and Cuban negrismo in the 1920s contributed to broader efforts to keep pace with transformations unleashed by ongoing conflicts over imperialism, and he considers how those transformations were explored in novels by McKay of Jamaica, Jesús Masdeu of Cuba, and Miguel Ángel Menéndez of Mexico. Focusing on ethnography’s uneven contributions to decolonization, he investigates how Manuel Gamio, a Mexican anthropologist, and Zora Neale Hurston each adapted metropolitan social science for use by writers from the racialized periphery.